Click for full .pdf with details of the upcoming community workshops. Be sure to join the Department of City Planning next week as the department hosts two community workshops for the Crenshaw Boulevard Streetscape Plan. The workshops will set the template for future streetscape enhancements, such as: street trees, street furniture, crosswalks, bike facilities and other features to encourage transit ridership and improve the quality of life in the neighborhood. Limited on-site parking. Street parking available. Or get there via transit! Street parking available. Or get there via transit! Note: These are among a series of Community Workshops that will take place over the course of this 2-year planning effort– additional details and workshop dates can be found over at the Los Angeles Transit Neighborhood Plans website as they are made available. For any questions about the project or upcoming workshops, please feel free to contact Patricia Diefenderfer or Andre Parvenu of the Department of City Planning. 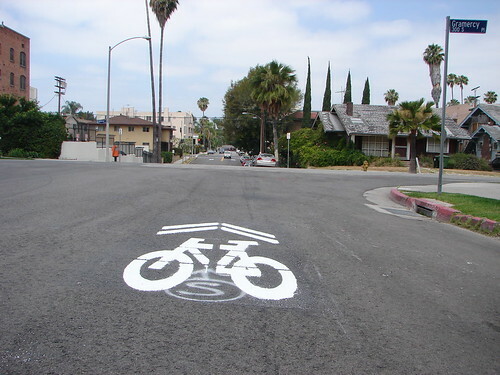 Over three weeks in late May and early June of 2010, LADOT Bike Blog took part in pre-installation studies for the LADOT Shared Lane Marking (Sharrows) Study. The study documented the interactions between drivers and bicyclists when a bicyclist traveled at the position where Sharrows would later be installed. At the end of the summer, LADOT Bike Blog again took part in studying the interactions between drivers and bicyclists, this time with Sharrows in place. It all culminates with the release in the next few days of the LADOT Bicycle Program SLM report. 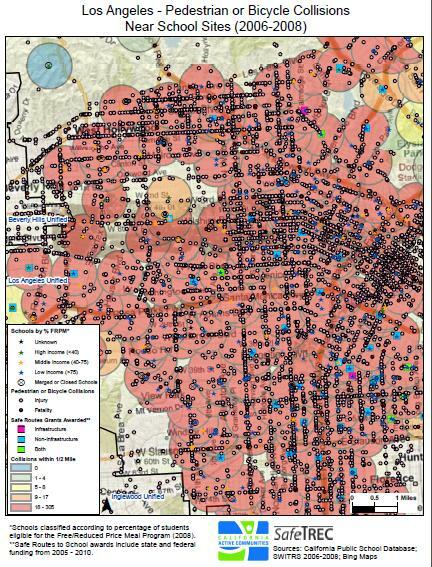 While the LADOT Bike Blog will have another write-up on the results of the report (and what it means for Los Angeles’ streets), we first wanted to give you a look at the goals, the methods, and the standards we used for the Sharrow study. We don’t just want Sharrows, we want Sharrows the right way. We’re happy to give you a look at how we got there. 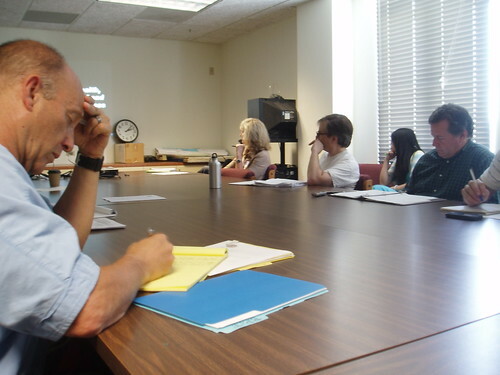 About this time of the month, the LADOT Bike Blog often posts up the agenda for the upcoming meeting of the Bike Plan Implementation Team (BPIT) – usually taking place on the first Tuesday of the month. Rather than an agenda, however, we’ll instead be discussing a number of changes being made to the BPIT – most notably, the cancellation of the August & September meetings, and the changes that will be put in place for October’s meeting. These changes (among others, detailed below the fold) were made at the behest of members of the bike community & other stakeholders, and should help make the BPIT more productive and equitable. 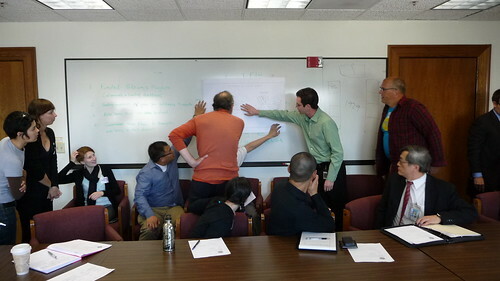 Next Tuesday, July 5th, will see the next meeting of the Bike Plan Implementation Team (BPIT). Here is the agenda for the meeting. BPIT meetings are held, as always, from 2:00-3:30 in room 721 in City Hall. This month represents a slight shift in the direction of the BPIT, both in terms of topics discussed and in terms of the decision process for new projects. If you want to help shape the schedule and priorities for the next stage of bike plan implementation, it’s incumbent that you attend July’s meeting. If you aren’t able to make it out to the meeting, leave your comments below and LADOT Bike Blog will make sure they get into the hands of City Planning. During the June BPIT meeting, DOT engineers presented conceptual designs for three projects in Downtown Los Angeles: Figueroa Street, Spring Street, and Main Street. 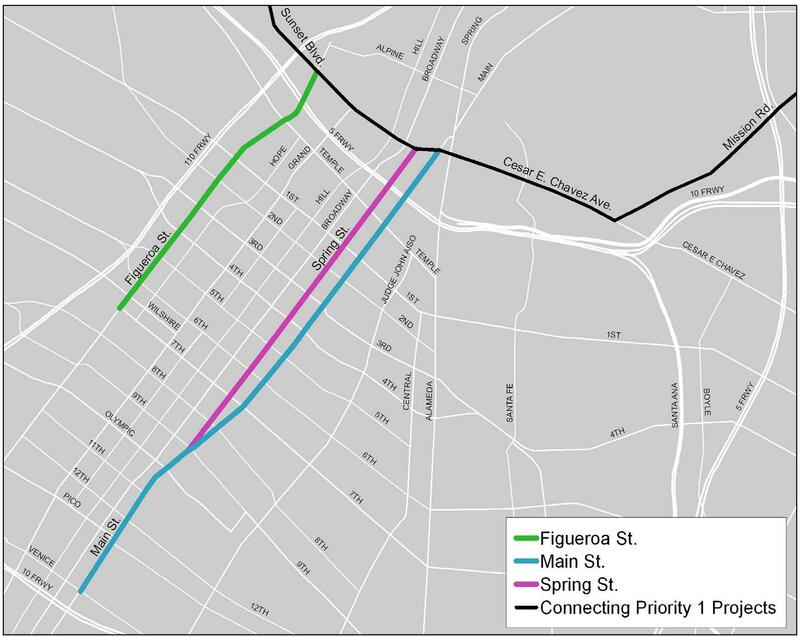 At the recommendation of BPIT attendees, the project on Figueroa Street had an additional option created that would also bring a bike lane to Flower Street. The amended presentation was then given to the Planning & Land Use committee for the Downtown LA Neighborhood Council just last week, receiving warm support. Together, these projects represent 5+ miles of new, dedicated bicycle infrastructure within the city’s urban core. Below the fold, we will explore the different design options that City engineers are working on – as well as details about various constraints such as roadway width, street parking, bus lanes, etc that impact the infrastructure options for these streets. As always, please feel free to leave your comments and suggestions for how you would like to see Figueroa, Spring, Main, and (maybe) Flower re-imagined with bicycle infrastructure. In previous generations, the majority of school aged children either walked or biked to school. Children got more physical activity, our streets were less congested, and our air quality was better. 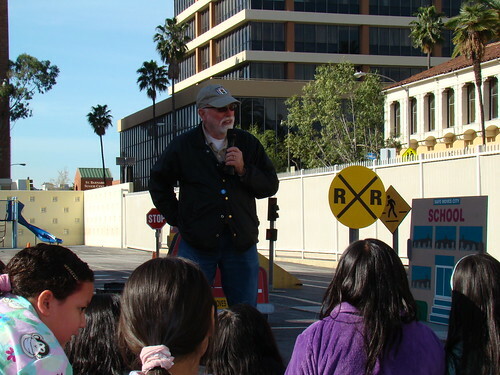 Fast forward to 2011: less than 15 percent of children living within a two-mile radius either walk or bike to school. A vast majority are either driven by parents or taken to school by bus. Increased traffic and safety concerns have made it inhospitable for many children to bike or walk to school.